Edit: Sprint and TCL have officially announced the KEYone will be available on Sprint's website tomorrow, July 14 for $528 or 18 monthly payments of $22.50. Click here for the full press release at the bottom of the page. A BlackBerry fan’s question was answered on the Sprint community forums when they inquired about the unlocked variant’s compatibility with the CDMA network. The rep replied: “While the BlackBerry KEYone is coming to Sprint we’re not supporting the factory unlocked version at launch,”. 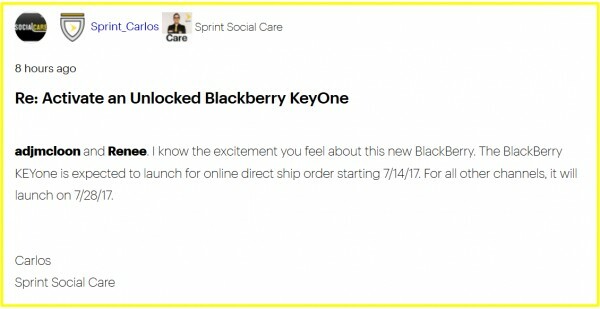 However, when two other customers asked about the Sprint variant’s availability, Sprint representative Sprint_Carlos assured that the BlackBerry KEYone “is expected to launch for online direct ship ordering starting [July 14 2017]. For all other channels, it will launch on [July 28 2017].” You can expect to see the KEYone in stores toward the end of the month as part of “all other channels”. BlackBerry hasn't officially acknowledged the supposed release date of the KEYone on Sprint's network. So don't be surprised if July 14 turns out to be a reference date. Sprint will be the first US carrier to carry the BlackBerry KEYone, which should bring more awareness to the device once it is put on display in Sprint Stores. The KEYone is already available unlocked from Best Buy, Amazon, and BlackBerry’s website for $549. It comes with a Snapdragon 625 CPU, 3GB of RAM, and BlackBerry’s legendary physical QWERTY keyboard. Sprint is usually the one that gives massive discounts to make up for their crappy network, no love for BB? And sprint wonders why they're last amongst all the major carriers.